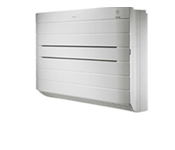 A high wall mounted unit designed for applications where there is little or no ceiling void. A low level unit is designed to sit at floor level where ceiling voids and high level wall space are limited. 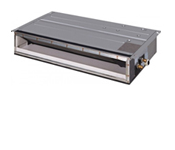 These units come with decorative covers or standard units can be installed within joinery having supply and return air grills. 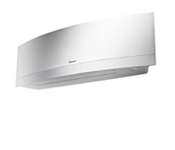 A slim ducted unit is designed for applications where there is a limited size ceiling void. 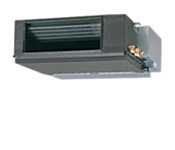 These units are ducted to supply and return grills within the ceiling..
A ceiling flush mounted unit designed to sit above the ceiling with the air discharge grill visible from below. 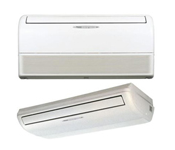 These units can be obtained in either 2 direction or 4 direction blow and are ideal in office / commercial applications. 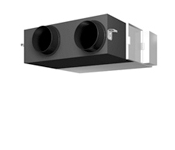 High capacity ducted units are designed for applications where there is no size issue with the ceiling void. 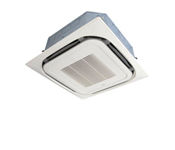 These units are ducted to the supply and return grills mounted within the ceiling. This is designed to be either mounted horizontally on the ceiling or vertically at low level on a wall. These units will keep the same visual look across the different unit installations. Heat recovery units extract air out and fresh air in while contributing to balancing the temperature difference between these simultaneous air flows. 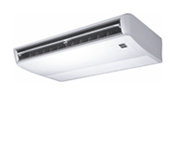 These units provide fresh the air in the best possible energy efficient manner.